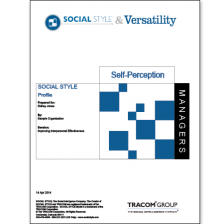 The Managerial SOCIAL STYLE® Managers Concepts Guide and paper based Self-Perception Questionnaires combines the SOCIAL STYLE Questionnaire and the Versatility Questionnaire with a managerial specific Concepts Guide. Providing in depth information about the assertiveness and responsiveness dimensions, the guide will help managers identify and appropriately respond to their direct reports’ SOCIAL STYLE. The Concepts Guide provides an overview of the SOCIAL STYLE Model in the context of effective management to helps managers understand their own behavioral style and the styles of others. 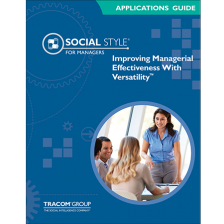 The Improving Managerial Effectiveness with Versatility Applications Guide helps managers to apply their knowledge of SOCIAL STYLE® and Versatility to increase interpersonal effectiveness and productivity for both themselves and their direct reports. This highly tactical reference guide adds tremendous value to any Managerial SOCIAL STYLE & Versatility product. The IMEV Applications Guide is designed for a manager with previous training in Social Style to help apply their knowledge of SOCIAL STYLE to improve their performance and that of their direct reports. It offers specific direction on applying STYLE when coaching others, providing feedback, evaluating performance, making assignments etc. Use as a takeaway or incorporate into your own program to enhance your managers’ ability to apply these essential interpersonal skills concepts. The Improving Managerial Effectiveness with Versatility Admin Kit which is a single resource to enable trainers and facilitators to quickly teach a SOCIAL STYLE class, including recommended course content for two-hour and four-hour training courses. 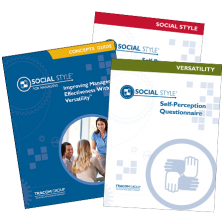 The Managerial SOCIAL STYLE® Self-Perception Administration Kit is a single resource to enable trainers and facilitators to quickly teach a SOCIAL STYLE class. 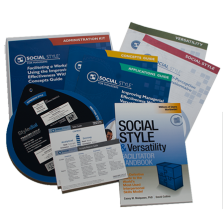 It provides relevant SOCIAL STYLE background and information about the SOCIAL STYLE Model™. It also includes the SOCIAL STYLE & Versatility Facilitator Handbook. Purchasing this administration kit qualifies the facilitator to become a SOCIAL STYLE Accredited Instructor. Details regarding the accreditation process will be emailed to you after purchase. 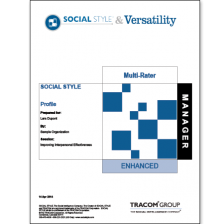 Multi Rater products can only be used by TRACOM certified trainers and are designed to take a more holistic 360 view of other peoples observation of your Social Style and Versatility in addition to your self perception. There are also a range of Social Style training programmes that certified trainers can deliver with a focus on leadership and management.